Y’all know my penchant for clothing that is fun to wear, right? Suffice it to say, this shirt takes it to a whole new level! I’m in love with how unique the look is, from the halter neckline to the dramatic, billowy ruffles. Definitely a stand-out piece that garners compliments wherever you go! Since the shirt made a statement in and of itself, I kept things summery and simple with white skinny jeans and black accessories! These black tassel earrings are a go-to of mine (I also love this style), and I’m continuing to love these affordable sandals I scooped up from Forever21. The resulting look is perfect for date night, dinner with friends or a girls night out! That top is darling!!! So cute. I love this top! I bought a few things from SheIn and i’m so impressed by the quality! I bought a shirt for $9 and it feels like a $50 shirt! Swooning over this top! I definitely need it for spring :) It look so amazing on you! Can’t wait to see what you have in store this week!! That top is absolutely utterly completely stunning! I love it! Looking forward to all of your fun this week, glad you had a nice weekend! 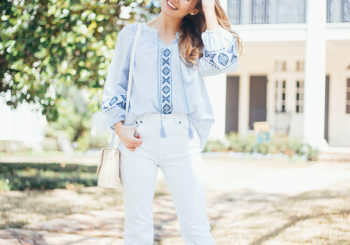 This outfit is the cutest, so perfect for spring!! 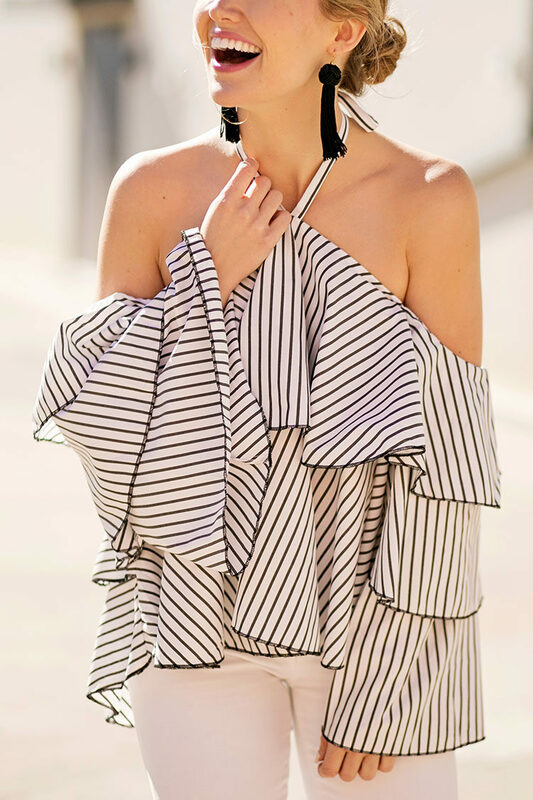 I have been obsessed with off the shoulder/cold shoulder everything recently!! 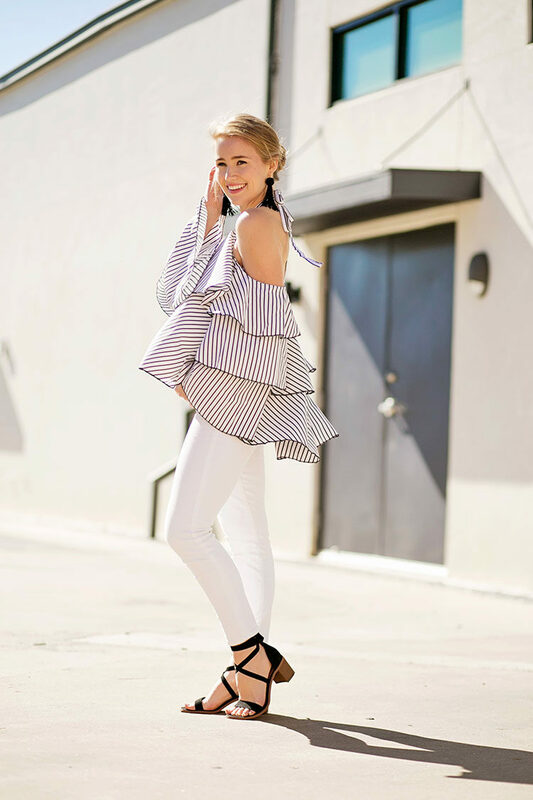 This ruffle top is gorgeous, I love how you styled it! This is a super cute look. I love the tassel earrings. They look great on you. LOVED the cinemagraph on your Instagram so I wanted to check this post out of course! What a gorgeous, fun take on monochrome!